Axial view of an individual's head showing a light-colored lesion in the cerebellum with a large, dark area that is a cystic component. Hemangioblastomas are the most common disease manifestation in patients with von Hippel-Lindau syndrome. 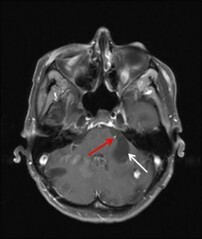 A cerebellar lesion (red arrow) is shown with a dominant cystic component (white arrow).